Saw your e-mail from Bryan Spence regarding Edward Spence who was a gunner on the ss Ramilles. My grandfather, William Turner was a merchant seaman, a steward on this ship and he was lost presumed drowned on 8th May 1941. 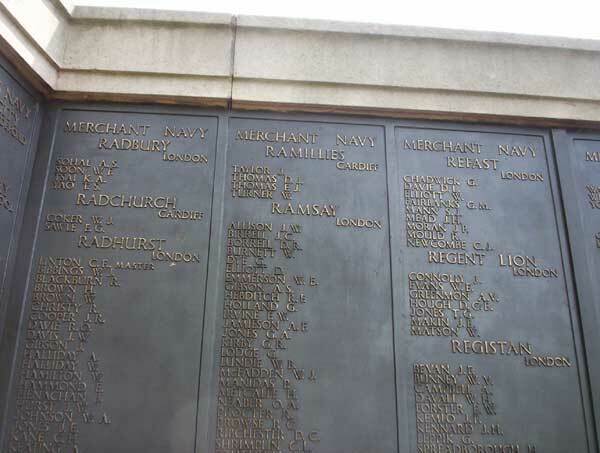 We have been to Tower Hill to see the memorial plaque dedicated to the merchant seamen in the 1st and 2nd world wars. 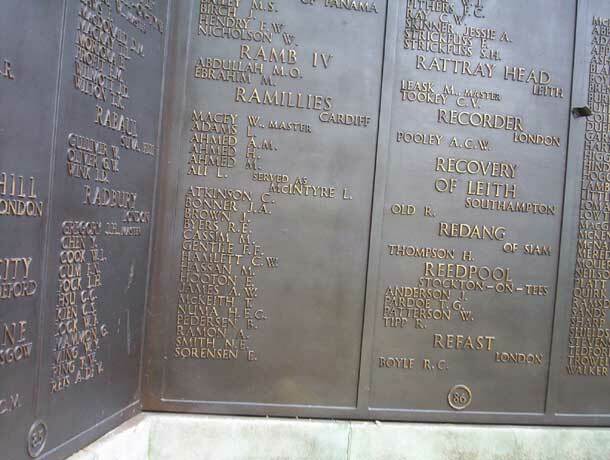 He is listed on panel 86 which shows all those who were lost on the Ramilles. The first on the list is W. Macey who was the Master. We have been trying to get a list of the survivors who we believe landed in Canada. So far we have had no success. According to my aunt there is a book detailing the life of the ss Ramilles, but we do not know the title and would be grateful if you could cast any light upon any of this. Australian Hudson Aircraft on the 16th. of June in 1943. Sorry I am of little help to you. Fate Sunk on 16 June, 1943 in Mediterranean, west of Haifa in position 33.00N, 34.00E by depth charges from an Australian Hudson aircraft (Sqdn 459/T). 27 dead and 21 survivors. Many thanks for your reply to my e-mail. Do you know whether Bryan Spence who was looking for information regarding Edward Spence, has now got a list of those lost when the Ramillies was torpeoed in 1941. If he doesn't, then I could send you the list along with photos of the memorial grave site. I would be grateful to have your list of those who died in the Ramilles torpedoing, and your photo. We would put them up on AHOY, and I would also send them to Bryan. 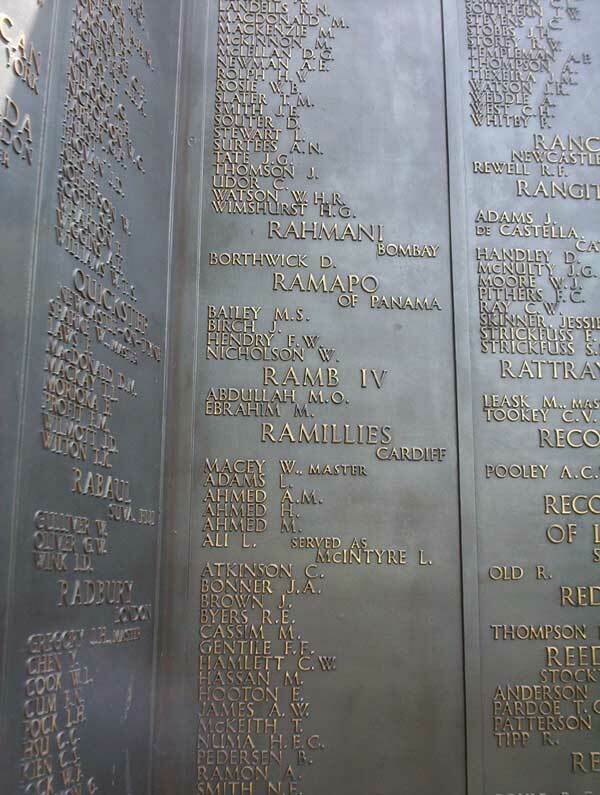 Thank you for that, I noticed on the Panel from the Tower Hill Memorial that the ship's name is listed as Ramillies. The previous information I had found spelt it as Ramilles. So off I went to try and find out which one is right, I knew her builders were William Gray and Company at Hartlepool. The proper spelling is Ramillies, and her Yard Number was 989, and the ship was built for Roath SS Company Limited, to be launched on the 13th. of July 1927. If you click on the URL it will bring up the name Ramillies, and the 4 pictures on the right will give you the 4 entries from her Ship's Particulars Book. You can Email each page to yourself, then print them out if you wish. I was wrong in saying the spelling was Ramilles, sorry for that, but there was also a Royal Navy Battleship with the name HMS Ramillies, by chance in 1940, Prince Phillip was a Midshipman serving in her when the ship came to Sydney, I was then a Cadet Midshipman in the Royal Australian Navy in HMAS Australia, and it was the first time I met him, then as Crown Prince Phillip of Greece and Denmark. I did not meet him again until the 1954 Royal Tour of Australia with her Majesty Elizabeth the Second, I had advanced to be a Lieutenant Commander, and was part of the Royal Guard mounted for the Queen. Through his marriage to the Queen , he was now an Admiral. But then I don't suppose you wanted to know all of that. Hope the attached photos are useful. The names on the panel (86) are as follows: Macey W. (Master) , Adams L., Ahmed A.M., Ahmed H., Ali L (served as McIntyre L., Atkinson C., Bonner J. A., Brown J., Byers R. E., Cassmin M., Gentile F., Hamlett C. W., Hassan M., Hooton E., James A. W., McKeith T., Numa H. E. C., Pedersen B., Ramon A., Smith N. E., Sorensen E., Taylor J., Thomas D. J., Thomas F. J., Turner W.